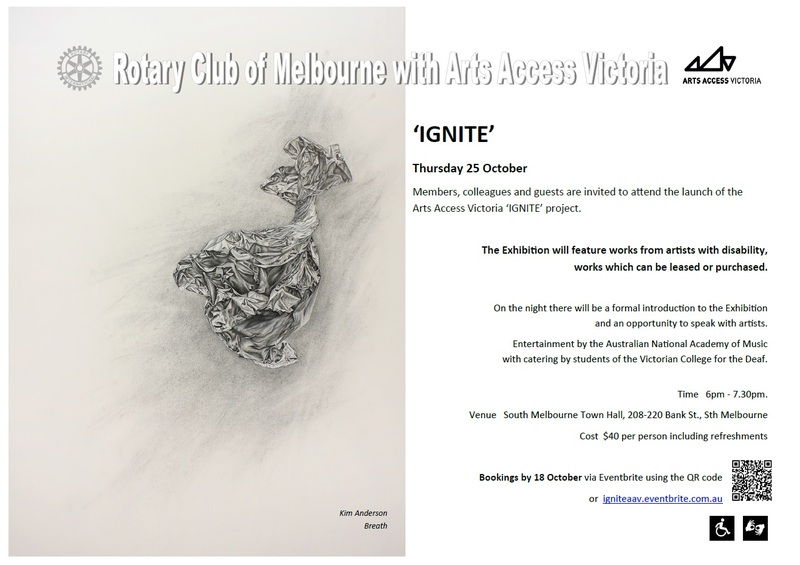 Ignite is a joint project of Rotary Club of Melbourne and Arts Access Victoria. This new partnership between Rotary Club of Melbourne and Arts Access Victoria, the State's leading arts and disability organisation which delivers community arts and cultural development programs for more than 2,000 people with a disability, aimed at securing employment outcomes. It also supports artists with a disability, enables Rotarians to have a greater visibility of their work and provides a potential source of income through acquisition or leasing of high quality artworks. This focus aligns with our wish to be involved in welfare projects which provide vocational opportunities for lesser advantaged groups in our community. A cocktail function fully catered by students from the Victorian College for the Deaf Music provided by musicians from the Australian National Academy of Music. Guests will be able to meet some of the artists and hear directly about the benefits of the project. The cost of the event is $40 per head, including refreshments and it is hoped there may be a small surplus which will be a contribution to Arts Access Victoria.